Pacific Asia is, in perspective of the Global Jihad, the large area which stretches from an undefined line in the Pacific Ocean between Japan and the Philippines in the East, Australia in the South, China and the Himalaya mountains in the North and the Indian Ocean in the West. 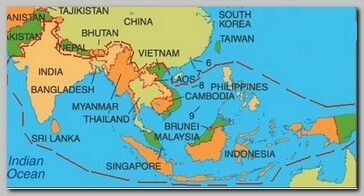 Pacific Asia covers about 13.000,000 km of land but the sea is the core of this part of the world. The sea stretches about the same size and more as the land. Pacific Asia has a population of about 1,780 millions – about 28% of all the world population. Pacific Asia has all kinds of political regimes, Democratic countries like India and Sri Lanka, absolute Dictatorship like Myanmar, Communist regimes like Vietnam, and countries partially democracies under military supervision like Thailand or Indonesia. From the 1.780 millions peoples approximately 530 Millions (30%) are Muslims. But in Pacific Asia, unlike other areas in the world, there is not a dominant religion, language or culture. Muslim faith, generally in a moderate version, is living alongside Christianity, Buddhism, Hinduism and endless number of sects and cults. Out of more than 30 thousand inhabited islands and regions have their own dialect and their own version of religious belief whether it is Islam, Christianity, Buddhism or Hinduism. Pacific Asia has no history of religious wars like in Europe but because of the enormous diversity of hundreds ethnic groups, almost all the countries in the area suffers from Ethnic tension, violence and activity of armed groups. It is a mistake to connect all the conflicts in Pacific Asia, where Muslims are involved, to the Global Jihad. In most of the cases it is a long lasting conflict between local tribes and ethnic groups and not a part of the larger conflict between Islam and the Western Democracies. Relatively to the number of Muslims in the area only a very small number of volunteers from Pacific Asia went to fight the cause of Islam outside their local region for the Global Jihad.